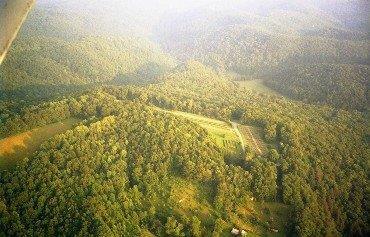 This is our dark site location less than a 40 minute drive north from Lewisburg,WV. The paved road on two sides of the 5 acre field perched on this plateau offers easy parking and a short walk to the telescope. Automobile traffic and any urban sky glow are minimal from this field, winds are generally light, and on a clear night the stars are brilliant. After logging many successful observing nights at this field, I feel it offers optimum viewing conditions and encourage your group to come here for a night sky tour. Since travel time, setup and dismantling of equipment, and any unexpected problems are kept to a minimum, group tour rates from this location start at $175.00 per night. If your group requires that I bring the telescopes to your location contact me for a price quote. A preliminary visit of your site to determine access and darkness suitability will be necessary. Any permission necessary should be obtained in advance. With the addition of integrated video cameras capable of displaying the focused telescopic image on a television monitor, group size no longer needs to be limited to 20. Waiting in line to view thru the eyepiece is eliminated and everyone can see a sharpe image simultaneously. Detailed discussion and a real classroom experience are possible using the cameras and monitors. More objects can be observed during an evening and first timers can be assured they are getting the best view. The techniques experienced observers have learned such as averted vision, dark adaptation, relaxed muscles, and steady eye, will play much less of an important role. Even someone confined to a wheel chair can have a thrilling experience watching as distant objects come up on the video screen. Call: (304) 497-2135 with your payment to schedule a group tour. Once payment has been received we will decide on five potential dates and work on those until a clear night presents itself. Should sky conditions prevent a tour from taking place it will be rescheduled for the next acceptable date. Recent additions of integrated video cameras with live streaming video can do much to overcome the washed out sky from a full Moon. However, to maximize the deep sky viewing experience, I suggest avoiding the week before the Moon is full and the first night after. Tours offered during this period will devote more time to the Moon, planets, and brighter celestial objects. Above is an 8min. exposure taken thru the telescope of comet Linear WM1 during the winter of 2001. Comets frequently sweep thru the inner solar system.